The Teen Economists: “Walmart is good for you!” Oh, really? “Walmart is good for you!” Oh, really? Her author profile can be found below this article. With the holidays approaching, one can hardly turn on the TV without being bombarded by commercials shouting that their store has the best deals and lowest prices. Perhaps one of the loudest culprits of these holiday season adds is Walmart. Long known for its low-price guarantees, Walmart is a front runner in boasting its benefits toward your microeconomic holiday family budgets. But from a macroeconomic perspective, Walmart can have less than positive repercussions for the economy as a whole. I recently read an economically faulty article, written by Tom Van Ripper, entitled “Walmart is good for you” which presented an alternative opinion, supported with scanty facts and jumpy assumptions. Tom Van Ripper began his argument on a foundation of sand, basing virtually his entire debate on the misguided conclusion of a recent study which stated “between 1985 and 2003, personal income, overall employment and retail employment grew faster in counties with a Walmart than in those without one.” The lousy economist incorrectly placed assumptions that because of this finding, Walmart must be the sole beneficiary force causing these positive economic happenings. In fact, there could be a myriad of other factors that caused this economic growth, such as higher investments in education or monetary policies. Van Rippers article continues with more misused statistical proof by quoting a statement from the Federal Reserve “Nearly 90% of the U.S. population lives within 15 miles of a Walmart store, and two-thirds of all retailers are located within five miles of one, the Fed’s report says.” Simply because the Federal Reserve released this statement does not mean it can be used as evidence towards the economic benefits of Walmart. Conversely, this statement simply shows the vast spread of the Walmart enterprise and how greatly such a behemoth could affect the US economy. In his article, Van Ripper failed to take into account how Walmart affects employment, small businesses, and overall the sacrifice of quality made goods for discounted inferior imports. It comes as no surprise that Walmart imports vast amounts of products from overseas. But the actual numbers may surprise you; Walmart was single handedly responsible for a 27 billion dollars in trade deficit in 2006 and these numbers have only grown since then. While most economist believe that trade deficits are neither particularly good or bad, this shows a huge dependence of the United States on other countries which can cause quite a bit of instability. In regards to employment, Van Ripper boasts the large number of people employed by the Walmart enterprise, but fails to realize the potential opportunity cost of the employees. 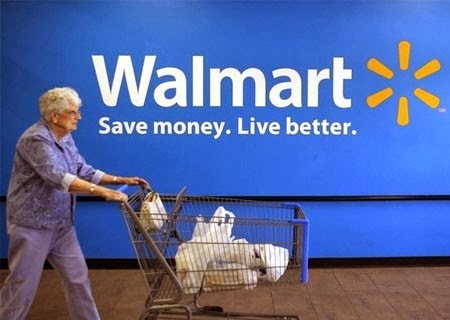 Because many people feel they can get a stable job from Walmart, since it is such a large chain, they may forge investing in additional education or even favor employment from such a large establishment rather than a local business. Lastly, the quality of products from Walmart has caused many American to set their standard at the lower price level and disregard the value of potentially higher priced American goods. As a result, these prices can make things very difficult for American manufacturers and small businesses and cause even more dependency on imports. To the credit of Van Ripper, he did mention that competitive prices, such as those provided by Walmart, can jump start an economy and force companies to better utilize their resources to improve their productivity. However, excessive competition of prices can cause American businesses to go bankrupt to the inferior quality of many imported goods which is often not taken into account by consumers as they comparison shop. Although many arguments could be made towards the constructive impacts of Walmart, Tom Van Rippers article is not one of them. Presenting ineffective proof, and misinformed economic principles, the article “Walmart is good for you” provides no substantial points supporting its argument. Conversely, I hope that this article has helped you to see that the effect of Walmart on the economy, which may seem great from a personal microeconomic perspective, can be potentially detrimental from the macroeconomic perspective. Stephanie is a high school senior studying in the US. Her favorite subjects include French, Economics, and Statistics. She plans to pursue business management in college. In her spare time she enjoys Irish dancing, cooking, and soccer.